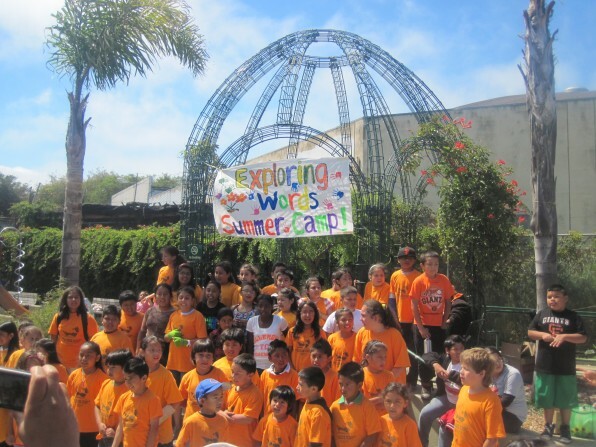 On July 27, sixty-two (first through sixth grade) students became certified graduates of Exploring Words Summer Camp, regaling spectators with an original play and educational-motivational adaptations of pop songs along the way. The graduation ceremony commemorated six weeks of intensive student efforts to catch up to reading and writing level. Put on by Mission Learning Center, Playworks, and 826 Valencia, Exploring Words Summer Camp combines reading activities, writing programming, and sports at Dolores Park to attain a focused environment in which students receive both the individualized attention and instruction they need to improve their literacy and a healthy slab of time to blow off steam through structured play. At 826 Valencia, students worked on writing prompts inspired by—for example—Frida Kahlo’s paintings, Pablo Neruda’s poetry, music from Disney films, and their own visions of and hopes for their future selves. Students composed letters, short stories, poems, and interviews before editing these pieces alongside tutors and sharing their work with the class. A committed volunteer base helped 826 Valencia work towards its goal of providing each student with one-on-one instructional attention. Such a favorable student-instructor ratio ensured that students could always receive an immediate response to their questions, ideas, sentences, and plot twisters. It also ensured that each tutor could work closely with the same few students over the camp’s course, thereby developing a nuanced understanding of each student’s educational and emotional needs—and strong bonds of friendship that made the students’ graduation bittersweet. I am a wolf. I live in the North Pole. I am a security guard for Santa Claus. there is made of the ground. This entry was posted in 826 News and tagged Exploring Words Summer Camp.